I was the proud winner of the Greenwich University MathSoc "guess how many sweets in the jar" competition at the Welcome Fair this week. 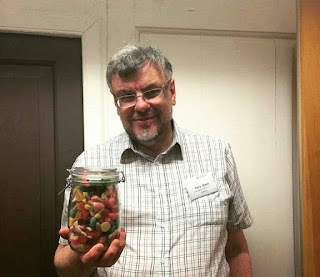 I was delighted to win because of the method I used, based on the "Wisdom of Crowds", which provided far superior to my colleagues' misguided attempts to estimate the volume of the jar and the average volume of the sweets. With a problem like "how many sweets in the jar", no individual is likely to be able to make a particularly accurate estimate. Some will guess in the right ballpark, while some will wildly over- or under- estimate. The theory is, however, that if one averages many independent guesses, the result is likely to be close to the solution. I tried this for my competition entry. I could see seventeen previous entries, so I added them up (rounding to simplify the addition of seventeen three-digit numbers while talking to the MathSoc team at their stand) and divided by 17. This gave me 337, which was my entry. The exact solution was 336, which is a striking vindication of the Wisdom of Crowds. Of course, this method isn't guaranteed to work. For example, if one had asked people to guess how many points Leicester City would win in the English Premier League in 2015/16, and taken the average, one would not have been close! Tony, Would you review my mad hatter logical riddle answer for why a raven is like a writing desk? goo.gl/x20PNK You may be amazed to discover this did have an intended logical answer dispite appearances!